The Broke and the Bookish : Top Ten Tuesday: Anna's Top Ten Most Inspirational Characters. 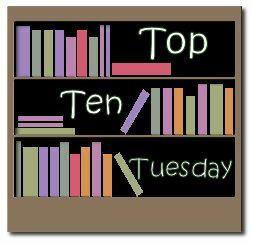 Top Ten Tuesday: Anna's Top Ten Most Inspirational Characters. Each week we will post a new Top Ten list complete with one of our bloggers answers. Everyone is welcome to join. All we ask is that you link back to The Broke and the Bookish on your own Top Ten Tuesday post AND post a comment on our post with a link to your Top Ten Tuesday post to share with us and all those who are participating. If you don't have a blog, just post your answers as a comment. If you can't come up with ten, don't worry about it---post as many as you can! THE TOPIC FOR NEXT WEEK IS: Top Ten Books I Wished I Read as a Kid. Check out future TTT topics. 1. Jane Eyre in 'Jane Eyre' by Charlotte Bronte- Despite the hideous clothes and the awful taste in men (I've never really gotten the appeal of Mr. Rochester) Jane Eyre is an incredibly inspirational woman. She is honest, hot-tempered, full of integrity and she always follows her conscience, even when doing so causes her a great deal of distress. She defies authority and lives life on her own terms. One speech of hers said in a moment of passion in has always inspired me: "Do you think I am an automaton?-a machine without feelings?..Do you think, because I am poor, obscure, plain, and little, I am soulless and heartless? You think wrong!" It echoes Shylock's famous speech in 'The Merchant of Venice'. I think Jane Eyre is one of the most inspirational characters in English literature, and fictional though she is, she has had quite an influence on me. 2. Albus Dumbledore from the 'Harry Potter' series. It's too bad people like Albus Dumbledore don't exist in real life (or if they do, I've certainly never met them). Albus Dumbledore has to be one of the most inspirational characters ever written. I find him inspirational because he's incredibly intelligent, wise and brave, yet just like any other person, he is deeply flawed. I've learned a lot from him. 3. 'Atticus Finch' in 'To Kill A Mockingbird' by Harper Lee. I would hazard a guess and say if you asked people what fictional character they find most inspiratonal, Atticus Finch would come up a lot and it's not difficult to understand why. A lawyer and widower, Atticus Finch is an incredibly wise and humane character. As a father he tries to lead by example and teach his children right from wrong. Atticus ignores the predjudice that existed towards black people, choosing to follow his own conscience instead. So much of what he says I find inspirational. For example: "..before I can live with other folks I've got to live with myself. The one thing that doesn't abide by majority rule is a person's conscience". He truly is an inspirational character. 4. Ursula Riggs in 'Big Mouth and Ugly Girl' by Joyce Carol Oates. I love reading books that have simple plots (in this case, girl befriends boy who has been wrongly accused of threatening to blow up his high-school) and well-rounded, quirky characters. This book is a great example of this. Ursula is the first character I've ever come across in a book who completely embraces being unattractive. She calls herself 'Ugly Girl' and sees it as a positive thing. She is also brave, honest and a loyal friend. In a world where people, especially women are constantly told the importance of being attractive, I found her to be very inspirational. 5. Laura Byrne in 'Is Anybody Listening?' by Larry O'Loughlin. Whoa. This book makes for tough reading but despite all the doom and gloom, the protagonist Laura remains a beacon of inspiration. Laura becomes friends two young children whose lives are in grave danger and does everything she can to try and save them. I find her inspirational because she's smart, funny, brave and she stands up for what she believes in. 6. Heidi in 'Heidi' by Johanna Spri. *Sigh*... this book has remained a constant favourite ever since I first read it when I seven. It's funny, although I'm now an athiest, and a lot of the book deals with Heidi's relationship with god, I still find her incredibly inspirational. I think it's beacause she forces me to change my perspective on life, to remember that joy can be found in the smallest of things. Heidi is wonderful. She revels in nature, she appreciates the simple things in life like gusts of wind and drinking a nice glass of milk. I've always found her inspirational. 7. Sirius Black from the 'Harry Potter' series. *Spoiler alert* For those who don't already know, Sirius Black is Harry's godfather and the former best friend of Harry's dad. I find him inspirational because of his courage and compassion. Black's life was filled with hardship and tragedy yet despite all the tragic things that have happened to him (eg his best friend being betrayed and murdered, being sent to Azkaban for a crime he never committed) he remains courageous, kind and loyal. I admire people who stand up and fight against others who commit evil deeds, thus I find Sirius to be very inspirational. Sirius fights Death Eaters, he is a committed member of the Order of the Phoenix and he is a kind and loyal friend and godfather to Harry. PS- damn you Bellatrix Lestrange! 8. Severus Snape from the 'Harry Potter' series. *Spoiler Alert* I think Snape is by far the most complex, interesting character in the 'Harry Potter' series. He's inspirational because he shows that one can make a mistake, a major mistake that one will spend the rest of one's life regretting but ultimately redemption is possible. Once Snape realizes the consequences of reporting the prophecy to Lord Voldemort, he immediately leaves the Death Eaters and spends the rest of his life trying to make up for what he has done. He dedicates his life to protecting Harry and fighting Lord Voldemort. The courage that this involves, and the way he completely changed his life around I think is highly inspirational. 9. Stargirl in 'Stargirl' by Jerri Spinelli. Who could be failed to be inspired by Stargirl? 'Stargirl' tells the tale of teenager called Leo who falls for Stargirl Caraway, a young woman who refuses to conform to the demands of high-school. Stargirl is one of the most unique, inspirational characters ever seen in literature. Stargirl strums the ukulule at lunch, carries around a pet rat, and in her spare time does selfless deeds for others. I find her inspirational because of this, and also because I can appreciate how difficult it often is for people to stand out in secondary school and I respect anyone who does it. 10. Rachel Walsh in 'Rachel's Holiday' by Marian Keyes. 'Rachel's Holiday' tells the story of Rachel Walsh who is furiously angry when her family send her to rehab for drug and alcohol addiction. While Rachel is in rehab, we get flashbacks into the drug and alchohol-fuelled life that Rachel led in New York and we get to witness Rachel's slow transformation. I find Rachel really inspiring partly because I can relate to her a lot. She's inspiring because she ultimately begins to accept who she is and to rid herself of all of her insecurities. She struggles to overcome her addictions and ultimately, after much hard work, she succeeds. I had Atticus Finch too - love him! Rachel from Marian Keyes' book is a good one too. Rachel's Holiday is one of my favourites of hers. Ah, there were so many good Harry Potter characters to choose from. Curiously, earlier today I saw Atticus Finch on a list of 'excellent fathers in fiction'. Such great characters, I love all The Harry Potter love. Aww, Stargirl! I also love the idea of Snape as inspirational...I never really would have thought of that! Great list. I also had Atticus Finch! Personally, I never understood why Snape had to treat people like Neville as he did... hence the commentary surrounding my 2nd choice. Jane Eyre is another excellent choice! I am as you, I like very much characters of Harry Potter ! This is a great list. I never would have thought of Heidi. Maybe I need to reread it. Hope to have my list up soon. I love your list. I had a hard time coming up with mine, and I just know I'll have better ideas when I'm not trying to think of them anymore. I love Snape as a character. I never lost faith in him. Nice that he made your list. I'm not familiar with a lot of the characters on your list, but I do heart Heidi! I loved the simple way of life that she followed. I read it so long ago. i really don't remember a lot of the religious stuff. I am due a re-read. I couldn't come up with ten for this one because I'm SUPER picky and cynical. I do love Atticus Finch, though- he is a great character! As I was writing up my entry, I realized that they pretty much all exhibit one of the same traits: bravery. And I'm noticing that theme with your list too. I wonder if it's just a coincidence, or if that trait will show up on a lot of people's lists? Agree with almost all of those - especially Jane Eyre. I love her. And for those that I don't agree with - that's only because I haven't read them. Time to update the wish list! Nice idea for the top ten! It's hard to come up with truly inspirational characters. I love that you have Serverus on here and you make a good argument for him being inspirational. I wouldn't have thought of him. "Inspirational" is such a subjective term, but I chose ten I have been inspired by throughout my life. Great idea! I struggled to get a few, but I hope more come to me throughout the day. Great idea! Dumbledore made my list as well. And, I agree that it's too bad there aren't people like him in real life. I love that Snape and Sirius also made your list. Jane Eyre was my top choice too. Nice list! I love Jane's speech too! That's a lot of Harry Potter characters. So many of them have inspirational qualities. I thought of Stargirl but then decided that I was going with all adult books this time for my examples. But, as per usual, I completely forgot to use any Harry Potter examples. Stargirl and Atticus! i love your choice of Ursula Riggs, i love that book and didn't think about it for this but it definitely fits. Thanks for offering these challenges: I'll keep coming back and checking others' posts too to find kindred spirits and unique ideas for my next great read! I agree that "inspirational" is subjective...I had to actually define it for myself before I could make my list. I see a theme of perseverence that runs through my list. This was a thought provoking list and I truly enjoyed it! Great choices! I love all the Harry Potter characters. Atticus is also on my list. I love how this list includes no less than 3 characters from Harry Potter. Excellent work! Lol apart from that, I loved this list. Yes to Dumbledore and Sirius and Snape. But especially Dumbledore. What would we do without him? Thank you for sharing this list. I love that book.